May your opinions be with you always~ Let them Out, Loud and Clear!!! It is Christmas Eve, with very few hours to go before we come into the Winter's most festive time of the year. Are you prepared for the Season of Joy to spring up...? The 12 Days of Idols is on its last day, and I still have a review to do! Weirdly enough, this time around I am taking a look at an Idoling!!! PV with a winter title and a cold feeling to the look of the video. And by cold, I pretty much mean the clothes the girls are wearing outside! Brr! And by weirdly enough, I actually mean that I never anticipated to review an Idoling!!! PV after I had an initial idea of what I would be reviewing for the 12 Days of Idols; I found very few, if no, songs or PV's by this group that I wanted to review. And then this one popped up. ... In fact, it only just popped up yesterday! Amazing coincidence, I have to say. Though I will be honest, there is a reason behind reviewing this one, and that's because I know Steve of Selective Hearing likes Idoling!!! greatly and hails the ground they walk on... so in a sense, I am trying to people please. But I like being a people pleaser, so there! So first blow to the group, I really was not keen on this song when it opened up. Admittedly both the song and video get better the longer it goes on, and towards the end I was far more impressed than I was in the beginning, but my initial impression for both the visuals and sound were these lovely thoughts; Bland, boring, and they can't sing together as a chorus well at all. I still think that the opening is horrible, because the sound of the girls all singing together is rather grating on my ears, but my impression of the song and video are far better now than they were the first time I watched this video and heard the song. But as I said, it gets better as it goes on, which I'm extremely grateful for. If I hated it or found it stupidly boring like I thought I would at first, then this review would not be here. Ouch. That said, the video is my favourite thing about the release itself. It's extremely simplistic, but it looks nice in my opinion. 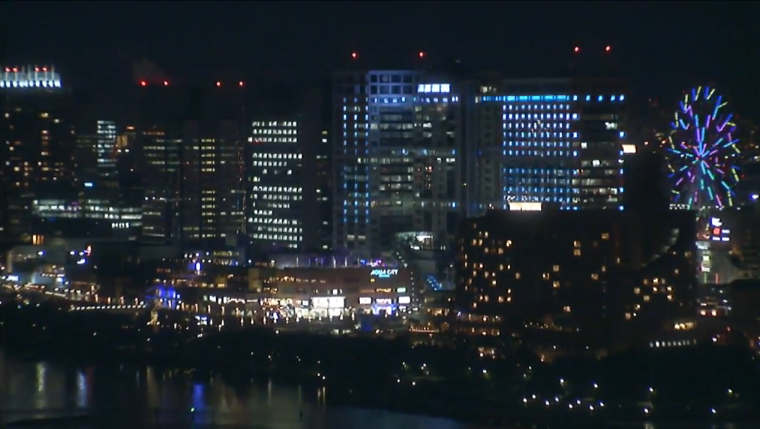 It's all shot outside during the night time, and bright lights are switching into various shapes and moving around behind the members of Idoling!!! as they perform their dance and music number of Samui Yoru Dakara... it's really nicely done, though I must admit that there were far too many times where I would stop watching Idoling!!! and just look at the lights in the background, because they weren't that entertaining. Second blow, and double ouch. Given that this is a performance PV, I do think that a better dance number or more thrilling uses of expression, or even different solo shots, would have worked in favour of the video, because the simplicity and Idol-ness of the dance is rather dull and over-used. There were some cute moments in the PV though, don't get me wrong, it's just that I was more aware of the pretty lights in the background sometimes when I was getting bored of the dance and the lack of change in pace the video used (maybe it's because I am part magpie). Of course, some of those Idol-like dance moves used were cute and caught my attention, but I was also aware of how sweet some of the girls looked. 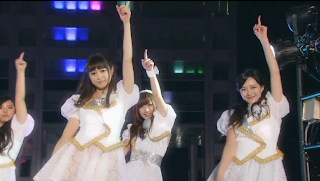 A few big smiles and bright eyes caught me off-guard and brought me back to watching Idoling!! !, charming me into giving them a bit more of my attention and swaying me from the lights. Not all the girls were sparkling though, some looked rather bored or were concentrating too hard to smile much, but the few who did are girls I will probably take more notice of if I ever decide to watch more Idoling!!! after this. I actually really like the idea behind the PV for Samui Yoru Dakara... with the use of the lights in Japan, showing off that Christmassy feel and the excitement of the brightness it brings to us when we prepare for it, as well as showing the girls dancing in the night air, wearing clothes that will truly make them feel cold but, despite that, still dancing happily, bringing joy to not only themselves but their spectators. With what has been used, for such a simple PV, it is still bright and joyful in its own way and feels pretty festive for me, reminding me of the beautiful views we get during this time of the year thanks to bright, colourful Christmas lights and the displays that we see in town. 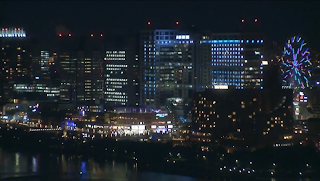 The video does have some very pretty scenes, mostly the ones taken at a distance where we can see the full glory of a Japanese city when the lights are on, giving us the full effect of the City at night and just how much it shines. With all said about the video, the song itself is actually quite nice as well, but I'm still not a fan of the opening, or Idoling!!! singing as a chorus all together in general. It may just be this song, but the slow tone of the opening as well as the similar pace in the bridge of the song is rather grating and annoying to the ears. It does not, in any way, sound pleasant to me at all, and was one of the reasons why I was ready to just stop listening to this song all together. 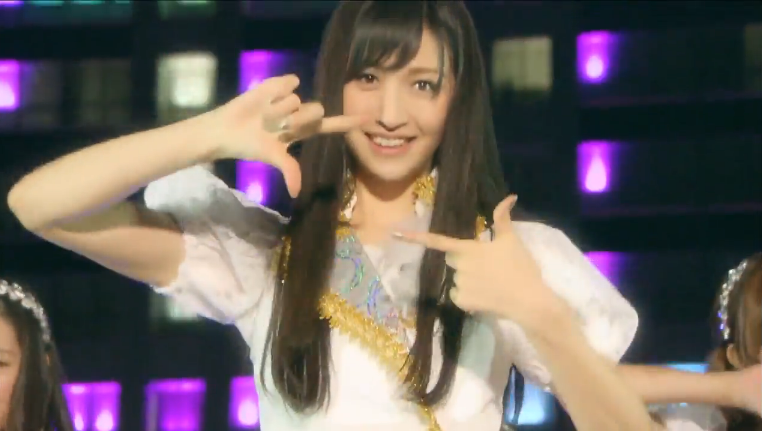 I was about to just ignore it, like I do most Idoling!!! songs now, but because I wanted to hear it for the sake of giving it a chance, or Steve might not be a happy bunny with me (what a funny image), I listened to it, and found that the smaller group parts were much more pleasant and worth the terrible opening and bridge of the song. Thank goodness that there was some good salvaged from this! It is a rather pretty song, though not a great song. To be honest, I am not an Idoling!!! fan because I do find a good majority of their music dull or not to my taste (there are a few songs in there I love though) so I did go into this song thinking that I would probably hate it, or at least find it so mind-numbingly dull that I would never want to hear it again, or forget about it within a second. Weirdly enough, this one is catchier than I expected, and I have found myself singing along to it a lot as I write this review. It's one of those songs that embeds the chorus into your brain, and does not let it out. 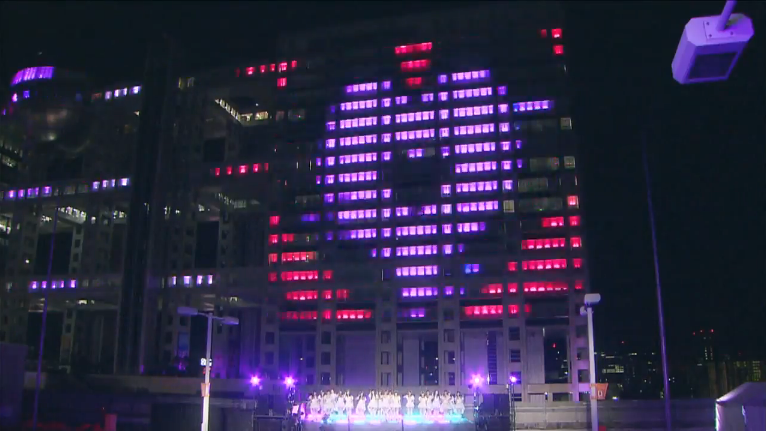 It's cheerful and quite fun, and it drags you in to include you as they perform. I think that this will be such an enjoyable song for those fans who do like to sing along, because it is nice to just sing those chorus lines at the top of your voice. I was honestly surprised by how fun I found the song after the first two listens, because I honestly did expect to listen to this, and then never hear it again because I felt it would be a boring, forgettable song. Looks like I was kind of wrong there. As a whole, I find the cover of TRF's Samui Yoru Dakara nice, cute and a good attempt, but I don't think that it is amazing. I kind of expected more from Idoling!! !, because I know Steve sings their praises greatly, but whilst this was nice and good enough for repeat listens, I don't think that I will revisit it any time soon unless I have an urge to hear this specific song again. I don't hate it, but I am not amazed by it either. Luckily it isn't the worst cover or song I have ever heard (I have reserved the monstrosity of Sentimental Journey by that horrible banshee Maeshima Ami for that title) and I am glad that I gave it a chance, even if it was because I wanted to people please. It's a nice video and a nice song, and it fits the theme of winter and Christmas nicely with the use of performing outside in the cold night air, and with the use of the beautiful flashing lights in the building windows. Such a simple trick, but an amazing one at that, and it brightened up the PV greatly. 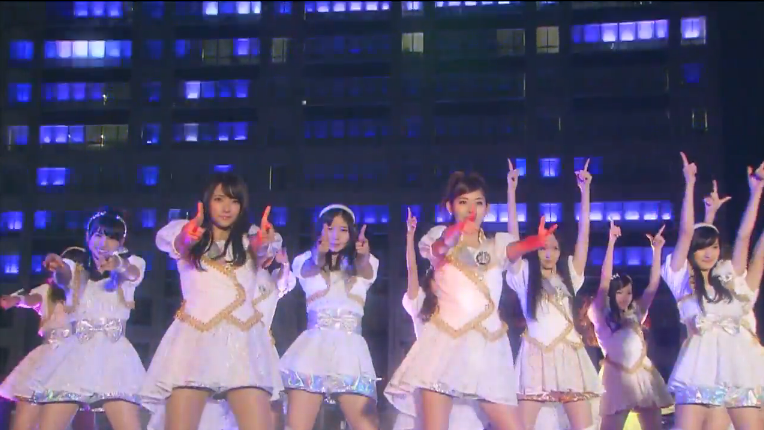 It isn't the best or worst video and song I have heard, and I do like Idoling!!! 's effort with this cover, because it is a pretty song at certain points, however there are things that I just don't like about it. Luckily, the good things outweigh the bad, which is why I reviewed the video in the end. It's nice to see that the simplicity of a pure performance PV is still there even in modern Idol days, even if it isn't from a group I follow greatly. 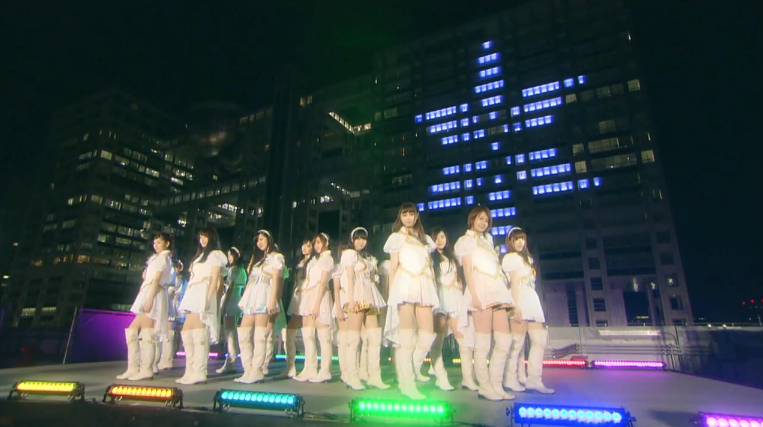 Still, it was nice to see that Idoling!!! had painted a simple PV with colour and sweetness, even if it didn't win me over entirely.